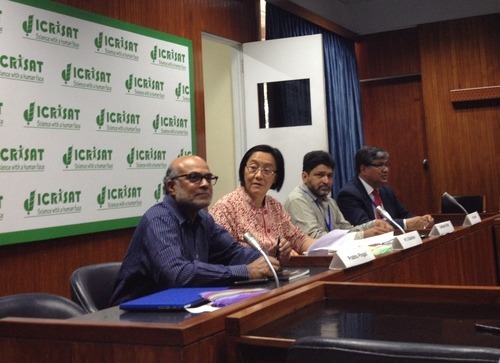 TCi recently coordinated a multi-sector meeting with plant breeders, economists, private agribusiness companies, NGO organizations, and intergovernmental organizations at the Hyperabad offices of ICRISAT to discuss how to expand supply and improve demand for protein-dense and biofortified foods in India. Program/Research Manager Katie Ricketts reports from India. increase per capita consumption of protein-dense pulses around the country through increased supply. Participants in this spirited discussion included a select number of academics and NGO participants, in addition to wide-spread participation by an eager private sector. After an initial day of discussing international and domestic models for aggregation with smallholder farmers, workshop participants broke up into two groups. One focused on the challenges facing increasing the supply of biofortified pearl millet, and the other on the impediments to elevating per-capita consumption of pulses through domestic supply improvements. Biofortification technologies—which utilize traditional plant breeding methods and not genetic modification—can help provide access to micronutrients for communities that depend on cereals. Pearl millet is a staple consumed in much of Rajasthan, Gujarat, and western Maharashtra. Biofortification of the crop requires increases in seed production and wide-spread adoption of the hybrid varieties in order to decrease relative prices and increase local demand. Yet millets are grown on marginal lands, with farmers who face lack of access to inputs, credit and other technologies, including biofortified varieties. Moreover, for demand to increase and for justification for a slightly elevated price, consumers need assurance that they are truly buying an improved product. 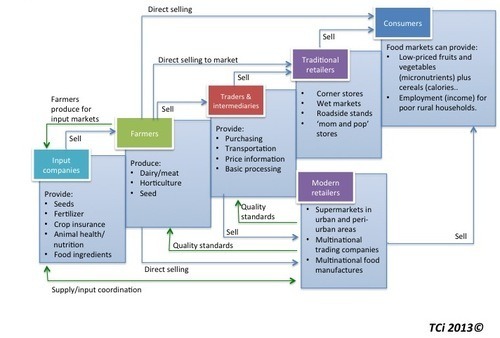 Among other things, this new market opportunity for smallholder farmers depends on the development of certified supply chains and marketing efforts that can grant farmers price premiums for cultivation and consumers confidence in product value. On the production front, farmer interest in cultivation of biofortified pearl millet will depend on access to necessary services that can help farmers improve productivity (access to inputs and extension) and certification efforts that can differentiate the product and enable price premiums. On the marketing front, coordinated efforts with public health officials, integration with school feeding programs (e.g., the mid-day meal program), the public distribution program (PDS) and other institutional buyers (i.e., ICDS), was thought to be capable of creating the marketing push for highlighting the benefits of biofortified pearl millet for both urban and rural consumers. Research and development should target increased productivity of biofortified pearl millet varieties at the farmer level. Meanwhile, increases in the consumption of traditionally available pulses, including chickpea and pigeon pea (key ingredients in various dahls and other Indian foods) can play a key role in sustaining access to protein-dense food that improve nutrition. Recently, declines in per capita consumption of these protein-dense foods have exacerbated the problem of undernutrition; for the poor in India, many are consuming less than 50 percent of their required protein. Increased imports from Canada are further reducing the incentive to produce local varieties. Strengthening demand for pulse production can mean income opportunities for rural families farming marginalized, rain-fed land where little else can grow. Currently, however, the working group noted how incentives at the policy and individual level are not aligned to expand production. Contextual factors suggest multiple reasons why farmers have moved out of pulse production. Imports of pulses have caused relative price decreases, which, along with poor yield prospects for Indian pulses (due to lack of research and investment) further reduce production incentives. Additionally, as irrigation development occurs, farmers move out of pulse production in favor of higher-value alternative cash crops. If pulses remain a ‘poor person’s crop’ and not a cash crop, the links between improved nutrition though increased income and improved nutrition though increases in available supply (placing downward pressure on prices) could be lost. Policy and awareness should be raised about vulnerable segments.